It`s that time of year again….a slight chill in the morning and evening air,the evenings drawing in….autumn is here! 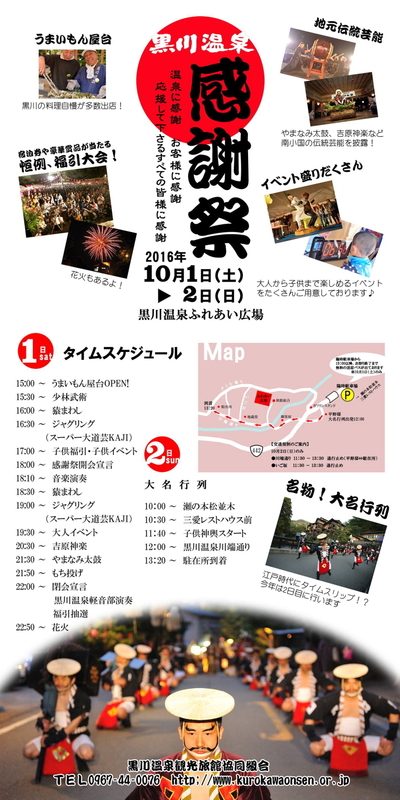 Be sure to pop along to this local festival for an entertaining evening if you are in the area on October 7th,when the Visitor Center car park becomes the focal point for the annual `Kurokawa Onsen Thanksgiving Festival`. Some food and drink stalls will be opening from 3pm in the afternoon,with events for children scheduled to start at 4pm. Various local bands will be playing on the stage throughout the evening,with a Kagura performance from 8:30 and Yamanami Taiko from 9:30pm. If you want to join in some silliness (past years have included bottom sumo contests!) then come to the main events area from around 7:30pm. Throughout the evening raffle tickets will be on sale,and the main prizes are usually vouchers for an overnight stay at a Kurokawa ryokan! Please note that the raffle draw takes place rather late,from 10pm,and is followed by fireworks to round off proceedings at about 11pm. If you are coming to Kurokawa by car,please follow signs to the overflow carpark a few minutes out of Kurokawa on route 442 past the Cosmos gas station,a shuttle bus will operate from the start of the festival until late. 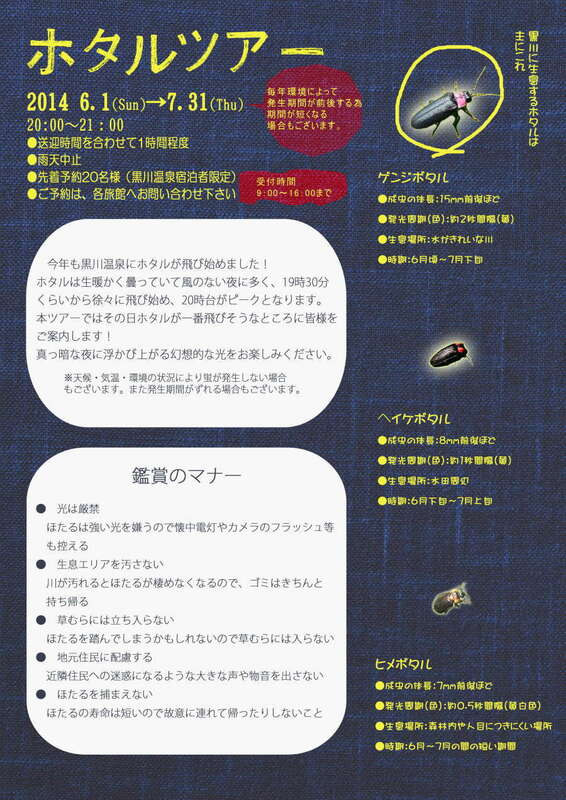 On Sunday October 8th,a parade of children in costume and a portable shrine will start at 11:40 from a point across from the Cosmos gas station and follow a route along Kawabatadori Street to the police station. The main parade,advertised as an `Edo time slip` starts from midday and will follow the same route. UPCOMING EVENT `Onsen Thanksgiving Festival` October 1st and 2nd,2016 October Event: 2015 Kurokawa Onsen Festival, October 3rd `Kurokawaonsen Kanshasai` festival schedule details October Event: Kurokawa Onsen Festival on October 4th and 5th! 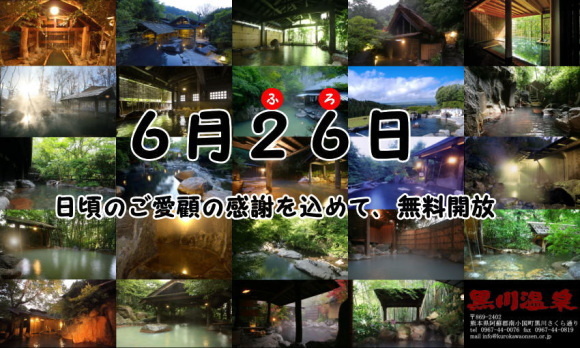 Once a year,on JUNE 26th, you can bathe in the public outdoor baths at any of the 24 ryokan belonging to the Kurokawa Onsen Ryokan Association for FREE! If you are a day-tripper you may use the baths between 10am and 3pm,ryokan guests however may bathe from 8:30am to 9pm. Pick up an English map from the Visitor Center and of course,don’t forget to pop into the reception of the ryokan first before heading off to use the baths!